The history of Rowan's Glen is not a pretty one. Legend has it a murderer stalks its woods, screaming out in the night. Pets have begun to disappear and mutilated remains have been discovered in the fields. Some folks are starting to worry that the long unseen Birch Markle has returned. Ivy wasn't even born when Birch Markle began his reign of terror. But she's heard all the stories and knows about the death of the Glen's May Queen, their last - until now. And even with the tremor of fear currently running through their community, some believe it's time to bring the tradition back. Ivy and her cousin are part of a small community that lives outside of town. They attend school with the regular kids, but otherwise don't socialize outside of Rowan's Glen. And Ivy is fine with that. She's happy in the Glen. Her cousin, Heather, wants more. And though they share everything, Ivy soon discovers that Heather is keeping secrets after all. The book begins with a missing animal. Another in a long string of missing animals considering they've been disappearing for some time. Which of course brings to mind the stories of Birch Markle - the Glen's most infamous resident. Ivy's grandmother shared the tales with both Ivy and Heather as they were growing up. But their grandmother doesn't talk these days. All of these little details (ok, some not so little) give readers a fabulous understanding of Ivy, her home life, and the community she's part of. They also set the tone for an ominous read. It reminded me in part of The Village, obviously. But the superstitions - both Ivy's mother's and her grandmother's - added a great layer of intrigue to the tale. It was the end where I felt The May Queen Murders faltered a bit. There's some misdirection that, unfortunately, feels a bit like an afterthought. Honestly, up until that stage I was all on board but I did kind of wish that the book had ended without that little extra bit thrown in. 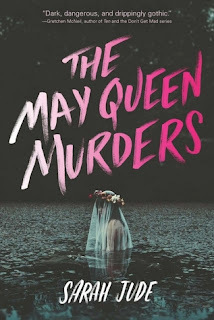 All things considered, I quite enjoyed The May Queen Murders. It's an overall satisfying and chilling read and Sarah Jude is definitely one I'll be looking forward to reading more from. Eden has long fought against what she sees as a possible and maybe inevitable fate. Determined not to take the same path as either her biological mother or her father, she avoids most social niceties and focuses instead on her academics. A full scholarship is her best hope for a good college, and the Peyton Scholarship in particular seems to be the answer. With valedictorian all but in the bag, it seems she's on the right path for a ticket straight out of her hometown. But Eden has a few obstacles in her way. The first is Ash Gupta, her primary rival in everything academics. The second is her father. And when Eden and Ash are forced to work together time after time, it seems their rivalry could be in danger of becoming attraction. 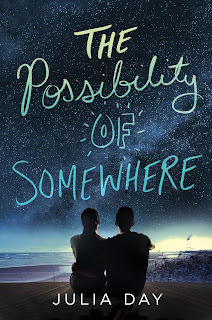 The Possibility of Somewhere is a sweet and charming read. 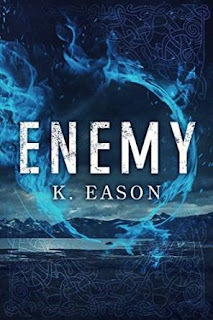 Eden, a somewhat foul-mouthed teen who closes herself off from everyone around her, immediately draws the reader in and rallies you to her side. Her home life isn't great, but it also isn't tragic, and she has the means and determination to do whatever it takes to ensure her future. But that determination has a down side: Eden has no friends. She doesn't allow anyone to get close, especially when the few times she's made exceptions have backfired. But Eden's armor proves to be no protection against the new girl in school. Mundy, a transfer from California who turns out to be the daughter of one of Eden's teachers, forces her way in and proves to be just the first big change of Eden's senior year. And Mundy proves to be exactly what Eden needs in her life - someone who will bring her out of her shell, offer her a shoulder to cry on, and will stand in Eden's corner no matter what. Though it turns out Mundy isn't the only one in Eden's corner by a long shot. I loved The Possibility of Somewhere. It was an overall light read (which it turns out I needed) but it also tugged at my heartstrings more than just a little bit. I loved that, as mentioned above, the story wasn't oh, so tragic. I loved that Eden had obstacles in her way but wasn't broken by them. And I loved that in the end, with a few exceptions, Eden had a strong support system behind her - and she comes to realize it, too. Like I said, sweet and charming! Hi, readers! Today I'm a stop on the TLC blog tour for Kerry Lonsdale's Everything We Keep. It's Aimee's wedding day, but instead of exchanging vows with her childhood sweetheart, James, Aimee and her friends and family are attending a funeral instead. James's funeral. James was supposed to have been going to Mexico for a quick business trip, but the trip ended with his disappearance. It was two months before his remains were recovered and sent home for burial. Aimee is beyond heartbroken, understandably unable to move on in the months after the funeral. But when a woman contacts her claiming James is still alive, Aimee isn't at all sure what to believe. James is gone, positively identified by his own brother. But Aimee has known James for so long, she's certain she'd feel it if he were truly gone. And something within her says he isn't. 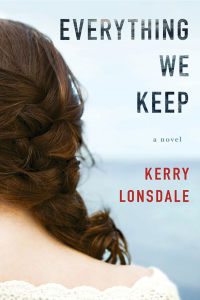 Kerry Lonsdale's Everything We Keep is an intriguing read. 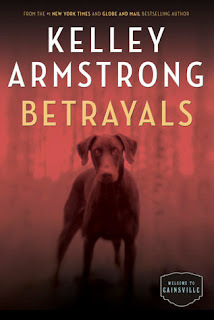 Much of the story is focused on Aimee's emotional state and attempt to rebuild her life in the aftermath of losing James. But there's a vein of suspense as well. Aimee and James had plans for their lives. Plans that included Aimee taking over her family's restaurant after her parents retired or even opening her own place. And since she's known James since she was eight years old, her past is as deeply wound around his as her future was to be. So yes, moving on without the person who is so deeply a part of her life is going to be challenging, to say the least. Lonsdale does a fairly good job of tackling the emotions of grief, though they certainly could have been explored much more deeply (that said, the book isn't really a tearjerker and I was glad for it!). I really liked Aimee. She was fleshed out and genuine, so it was easy to become emotionally invested in her story and to want to see where it would go and how it would play out. But it was the mystery element as a whole that really made me want to dive in and continue with Everything We Keep. It's in Aimee and James's backstory that this bit of mystery begins to unfold. James's family is weird. Stringent rules, a required commitment on the part of each member to be involved in the family business, and especially James's mother's regard of Aimee from the very start of the book all make the reader wonder what's really lying under the surface of this seemingly picture perfect family. And of course there's a psychic's claim that James isn't actually dead. Everything We Keep isn't a deep read. In fact, it's a bit like sitting down with a Lifetime movie in book form. But like those movies, it was fun! I did kind of hate the ending, in an "argh, you're killing me," kind of way. But Lonsdale's debut was one that I definitely could not (and would not) put down until I'd reached the bitter end! For more on Kerry Lonsdale and her work you can visit her website here. You can also like her on Facebook and follow her on Twitter. Things are getting tense in Londinium. Will is under pressure to secure his lineage, per orders from Lord Iris himself, while also trying to keep the truth about Margritte under wraps. Cathy's drive to change things for the women of the Nether isn't helping. Even though he agrees on most counts, the other men of Londinium are none too pleased about the prospect of their wives being more than arm candy. Up in Mundanus, Max has started a new investigation into a rash of missing people, including his own father. As his case progresses, his path crosses once again with Sam, the new Lord Iron, who faces challenges similar to that of Cathy. Turns out the Elemental Court is about as eager for change as the folks of the Nether! I love this series! With an undying passion! I seriously want everyone to discover the fabulousness of the Split Worlds and am so very, very glad that Newman has had the opportunity to bring us more installments! As I'd mentioned in my release/what I'm reading post a few weeks ago, there are currently plans for a fifth installment to be released next year. I am dying to see how things will turn out for Cathy, Will, Max, Sam, and the others. A Little Knowledge has started to address some of the questions of the Elemental Court and their purpose. We've also returned to the Sorcerer issue (no spoilers) and maybe a bit more insight into the plot there. But the true goals of the fae are still in question. What does Lord Iris envision for Will and Cathy's son? Why is Lord Tulip so interested in Cathy's "full potential?" And when will the people of Albion catch on to the progress that seems to be passing them by!? Emma Newman's series is filled with fabulous characters, intricate detail, and tons of political intrigue. And of course magic and fae. The combination alone is appealing but paired with Newman's fabulous prose, the series is a serious stand out! But I wanted to do an agenting post today because anyone who follows Writers Digest or Chuck Sambuchino may have seen today's list of "9 Literary Agents Seeking Horror NOW" - which I'm lucky enough to have been included on. If you've followed the blog for a while then you're well aware that I'm a horror fiend. So it makes sense that it would be one of the genres (and there are a lot) that I'd want to champion as an agent. And while I don't have an agent wish list of topics, per se (because I'm basically looking for a great books in general! ), I did want to share some of my favorite horror reads, in case you're curious about what appeals to me. And now for the giveaway. Adam Nevill's No One Gets Out Alive is now out in paperback and I have a bright, shiny copy for one of you. To enter simply fill out the Rafflecopter below before Monday, August 29. Open US only. Good morning, readers! 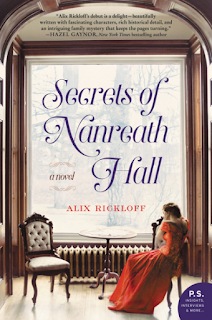 Today I'm a stop on the TLC blog tour for Alix Rickloff's Secrets of Nanreath Hall. Anna's parentage has never been a secret, but when her new post is to Nanreath Hall - the home where her mother once grew up - she hopes to get her adoptive parents' opinion before deciding. Graham and Prue Handley have something to tell her, but unfortunately before they can reveal what they know they're killed in a London bombing leaving Anna orphaned once again. When she arrives at Nanreath Hall, Anna finds she has a cousin and aunt in residence. The cousin is curious but her aunt wants nothing to do with her, even offering to use her clout to get Anna a posting as far away as possible. Now Anna has to decide whether to take the opportunity she's so longed for or stay and learn more about the family she's never met. Alix Rickloff, aka Alexa Egan, tells the story of two women and two wars: Lady Katherine Trenowyth, a fallen heiress who followed her heart in the years up to and following WWI, and her daughter, Anna, orphaned after her mother dies of cancer and working as a nurse for the Red Cross Voluntary Aid Detachment in WWII. Katherine, who begins our tale in 1923 already dying of cancer, was raised the daughter of an earl. Given everything she could ever dream of, she longed for the one thing she could never have: an education at an art school. And so when an artist catches her eye, even the promise of scandal can't dissuade her. A generation and a war later, her daughter Anna has only just recovered from a terrible injury courtesy of German bombers. The "incident," as others are fond of calling it, also claimed the life of Anna's friend and left Anna unfit to be sent overseas for duty. But it's still a posting she wants desperately. And so the assignment at Nanreath Hall is something of a disappointment - and a shock considering it's her ancestral home. At the request of her mother, Graham and Prue Handley have never kept Katherine's story from her daughter. But it's clear there are still secrets. Being the daughter of an unwed mother who fled her own family doesn't really leave much room for being welcomed into the arms of the remaining Trenowyth family, and yet with just two aunts and cousins remaining - one of whom is the current earl and seemingly ok with Anna's presence and acknowledgment -, Anna's reception is more icy than even she'd expected. The tale unfolds through alternating chapters, giving readers glimpses into Katherine's story as well as that of her immediate family alongside Anna's own journey and eventual discovery of the truth about that generation. 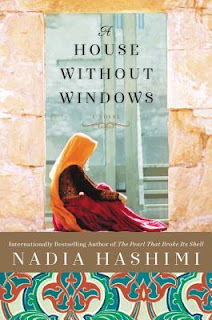 Bookended by two massive wars, its a tale that is of course fraught with tragedy but one that is also filled with hope. And interestingly, the story doesn't end with Secrets of Nanreath Hall. Both timelines mention sister Cynthia and her daughter - Cynthia is the cooperative Trenowyth daughter who lives overseas as Anna's story plays out. Apparently Rickloff has plans to follow up Secrets of Nanreath Hall with Cynthia's daughter's story: "...who has departed Singapore for England under a cloud of scandal on the eve of Pearl Harbor." (According to the interview included in the back of Secrets.) It's a good thing people were so incredibly scandalized so easily during this era - it's great fodder for historical fiction writers for sure! And now for the giveaway. I've got one copy up for grabs today - to throw your name in the hat simply fill out the Rafflecopter below before Monday, August 29. Open US only. For more on Alix Rickloff and her work you can visit her website here. You can also like her on Facebook and follow her on Twitter and Pinterest. Hi, readers! 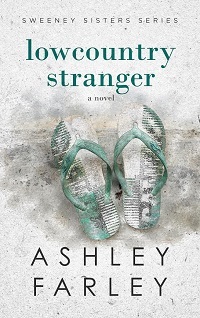 Today I'm a stop on the TLC blog tour for Ashley Farley's latest, Lowcountry Stranger. 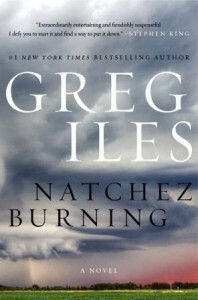 Note there is a tour wide giveaway for this one, so do be sure to read through to the end to enter the Rafflecopter. It's been months since Faith's daughter, Bitsy, last spoke. And while they've all taken some time to get over the incident that caused this selective mutism, everyone expects it'll simply take more time for Bitsy to open up again. But then a strange girl crashes Faith's wedding. As she wanders the celebration stealing food and pocketing other items, she also speaks to Bitsy - and Bitsy answers. Everyone is so blown away that they can't help but feel some sort of obligation to the girl, especially when they learn that she's been abandoned partway on her own journey to New York City. And so they offer her a place to stay in exchange for helping with Bitsy. Even so, none of them is quite sure what to believe when it comes to their new houseguest. Readers, I had a hard time getting into Lowcountry Stranger. It was clear at the start, as sisters Faith, Sam, and Jackie narrate Faith's wedding, that there's a history here. And it's one that the author does make an effort to rehash as the story begins. Unfortunately I still felt lost. I did realize it was the second in a series that I hadn't read before but I'd hoped that I would have an easier time getting into the family's story. It does pick up, but that shaky start stuck with me, overshadowing all. There was also, for me, a big sense of disbelief here. A strange teenager shows up at a wedding she's not invited to, packs her purse with bam biscuits and makes off with a wallet or two and the family offers her up a guest house - even when they acknowledge that her story seems off. Not only that, but they want to put their children in her care... And that's just the start. Perhaps, had I had a better grasp of the characters and their family dynamic going in, I would have enjoyed their second outing more. My fault. I've no doubt fans of Farley's Her Sister's Shoes will love returning to this family and seeing what comes next for each of them. If you're curious and new to this author, I'd recommend starting there before diving into Lowcountry Stranger. And now for the giveaway. Ashley is offering up a $50 Amazon gift card to one lucky winner! Again, this is tour wide so you only need to enter on one blog post. For more on Ashley Farley and her work you can visit her website here. You can also like her on Facebook and follow her on Twitter. 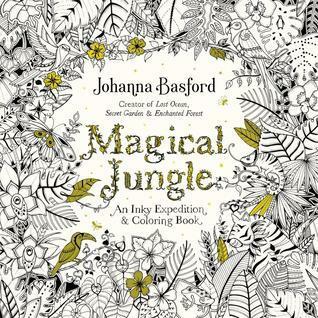 Coloring fanatics, today marks the release of Johanna Basford's latest, Magical Jungle: An Inky Expedition and Coloring Book. If you haven't tired of the adult coloring trend (and why would you!?) you definitely need this one for your coloring book collection. Not only is it packed with more of Basford's signature gorgeous illustrations and hidden images, it's jungle themed! If you're familiar with Basford's previous titles, then you know just how intricate and detailed her drawings are. And of course that translates into HOURS of coloring! My own first pick from the book is an ambitious one, especially considering how interested the kitten became as soon as I pulled out the coloring pencils (you can see a pic below - I'd barely gotten started when she knocked over an entire tray of coloring pencils!). But if she and the other cats allow, I plan to be spending ample amounts of time on all of the pictures in this one! To celebrate today's release, the publisher has provided a great Q&A with Basford herself. Enjoy! In your previous books, you’ve invited colorists to join you for inky adventures in gardens, forests, and oceans. What attracted you to the jungle for this new book? I’ve never visited a real Jungle, but the idea for this book came to me whilst visiting Aberdeen’s Winter Gardens with my daughter, Evie. The tropical plants are housed in huge glass greenhouses and whilst exploring them one day Evie pointed into the dense leafy undergrowth and shouted ‘Look Mummy! Tiger!’. The Jungle suddenly seemed like a marvelous place for an inky adventure; full of gargantuan leaves, exotic flowers and teeming with creatures big and small. A great place to let your imagination roam wild! What about coloring do you think is so therapeutic? I think it’s a great chance to unplug and indulge in a bit of a digital detox. We’re all glued to screens, be it our laptops, iPads or TVs, so to have the opportunity to lose yourself for a little while in something analogue and creative is often a welcome retreat. There’s no ping of a tweet or an email or the interruption of a new message to read, you can just spend some time focused on the task at hand and ignite your inner creative spark. Who is your favorite artist? Favorite author? We’re currently reading a lot of Dr. Seuss in our house. My favourite has to be Oh, The Places You’ll Go! It’s like an undercover self-help book with its motivational messages and no-nonsense advice – perfect if you are feeling a little lost or stuck in a procrastinating fog. I could never pick one single favourite artist or creative practice, these things change like the seasons. My current obsessions are terrariums, brush calligraphy, flat lay photography (still life for the digital age!) and pantone colour books. You’ve spoken about not being accepted to a post grad program. What about your life do you think would be different if you had gotten in? What are the benefits of a “real world” education as opposed to formal post-graduate programs? To be fair, I applied to do a post grad at the Royal College of Art in London because I didn’t know what else to do after Art School. It wasn’t the best reason to continue in education and I’m lucky they rejected me! Instead of spending 2 more (expensive!) years in education, I just got stuck into work. I did some internships then set-up my own studio. I made a ton of mistakes, but I learnt from them all. I think there’s only so much you can learn within the bubble of Art School, sooner or later you have to go out into the real world, find your clients, your voice, your style of work and just start living! Do you color in your own books? Not as much as you would think! I often test pens and paper samples by coloring in small sections of the drawings, but I tend to think of the books as collaborations. I create the artwork and draw the outlines, then it’s up to whoever buys the book to bring the color and make their mark. My job is the black and white line work, then I hand creative control over to audience. I think perhaps if I started coloring the books it would disrupt the natural order of things! In your bio you’re described as an “ink evangelist.” What does that mean to you? I prefer pens and pencils to pixels. I use the computer right at the end of my creative process to rotate butterflies, erase tea spillages and perhaps flip some symmetry. I absolutely don’t use the computer to create. I think the natural world needs to be captured by hand, it seems counterintuitive to try and recreate the beauty of a jelly fish or a coral reef in little square pixels! I rejoice in the wobbly lines, imperfect circles and the odd smudgy finger print – they prove that the artwork was lovingly crafted by a real person and not just generated on a screen. Your coloring books, Secret Garden, Enchanted Forest, and Lost Ocean, have been huge successes, with over 16 million sold worldwide. Were you surprised by that? What in your life has been different since the books took off? The numbers don’t seem real! Day to day not much has changed in terms of work. I still sit at my desk in my house in rural Scotland, drawing pictures all day and dreaming up ways to share them with the world. I’ll never fail to be surprised by the way a little idea, to create a colouring book for adults, has snowballed into what it has become. It’s utterly bizarre but also incredibly humbling to have the opportunity to share my work and collaborate with millions of people all over the world. Some days I look at the amazing pictures people post online of their completed colouring pictures and just think ‘how did this happen?!’. Now that your daughter is approaching two years old, have you started to introduce her to coloring? Of course! Although it was less of an introduction and more sabotage! Evie loves to find a pen or pencil and add her own little contribution to whatever might be on my desk – whether I want her to or not! Her favourite creative projects are our ‘Big Pictures.’ I tape a long strip of wallpaper to the kitchen floor, grab a marker and draw whatever she tells me (usually this involves butterflies, mice and raspberries), then she lies on the floor and colours it in with her crayons whilst I cook dinner. Traditionally, coloring has been considered an activity for kids, but obviously adults are big fans of coloring, as evidence by the success of adult coloring books! Your books are designed for adults, with very intricate and detailed illustrations, but do you see coloring as a family activity? Do you have suggestions for your fans who want to get their kids involved? I think any creative activity can be enjoyed by people of all ages, you just need to adapt it a little, relax and have fun. The reason kids enjoy drawing and painting so much is that they aren’t too precious with it. They never doubt their own talent or worry they aren’t doing it ‘right’ – they just get stuck in! I see so many great examples of my drawings coloured by kids – and they all look full of joy and energy and excitement! The best way to encourage little people to pick up a pen or pencil is to lead by example. Sit down and do some colouring of your own, don’t worry if you go over the lines and don’t over think your colour choice. Remember, there are no wrong colours! Suggest to kids that they can colour several sections in the same colour if the individual shapes are proving to be a bit fiddly and always advise that they go wild when it comes to backgrounds - encourage them to add their own drawings and embellishments! For very little hands, get a blank sheet of paper and a marker pen, then draw a simplified version of the page you are working on – perhaps a couple of big leaves and a butterfly – this way they have their own ‘special’ version to colour and you can keep your book crayon free! And lastly, remember collaboration is always the most fun way to work! Pick a page, then take it in turns to colour a bit! If you could pick one of your environments to inhabit as one of its critters or creatures, which would it be? Why? Oh I’d love to be a bee in Secret Garden! I just love bumble bees! Flitting from flower to flower, living with all your friends and enjoying the summer sunshine – what a life! About the Illustrator: JOHANNA BASFORD is an illustrator and ink evangelist who prefers pens and pencils to pixels. Her intricate, hand-drawn illustrations are loved the world over by those who have colored in (sometimes more than once) her bestselling books Lost Ocean, Secret Garden, and Enchanted Forest. Johanna is a graduate of Duncan of Jordanstone College of Art and Design in Dundee. She likes sugar mice, floral teacups, peonies, and bumblebees. Visit her online at JohannaBasford.com. Happy Monday, everybody! 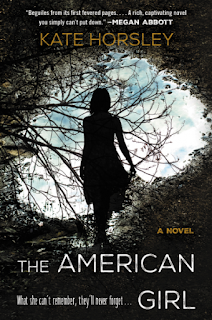 Today I'm a stop on the TLC blog tour for Kate Horsley's The American Girl. Quinn Perkins expected her months as an exchange student in France to be an adventure and a learning experience. But instead it turned out to be a nightmare. At the end of July, the American is found injured and comatose after stumbling her way out of the woods and into the road. The family hosting her has been declared missing and Quinn, when she does awaken, has no memory of what's happened. Molly Swift has been sent to France to cover Quinn's story. When she's mistaken as a relative of Quinn's, she's given exclusive access to the girl and her case. And even as guilt regarding her lies begins to weigh on her, she realizes she's Quinn's only real ally. This becomes even more true as the tide turns against the girl now at the center of everyone's attention. Ooh, readers! I absolutely loved this book! The twists, the pacing, the characters, and the fabulous ominous tone that encompasses the whole thing made it oh so deliciously wonderful to dive into. Quinn has amnesia. But we do have flashback chapters from her blog posts while she's been staying in France. And those posts show that all is definitely not sunny and fabulous with her host family. If she's to be trusted, that is. Chapters alternate between Quinn's present with the video journal her therapist has asked her to put together, Quinn's past - the blog posts mentioned above - and Molly Swift, a journalist who's task is basically to highlight cases in which the police have fumbled and proved to be inadequate. Molly is an interesting character. She has a somewhat dark past, which means she's willing to do pretty much anything to get her story (breaking and entering especially). And she proves to be a good person for Quinn to have in her corner, even if she's gotten there by less than honest means. I kind of loved her and really loved seeing the story unfold through her eyes. The American Girl is a wonderfully atmospheric thriller that will keep you guessing. I was glad it was a bit on the longer side, too, considering how much fun I was having trying to figure out where Horsley was taking Quinn and Molly next. For more on Kate Horsley and her work you can visit her website here. You can also like her on Facebook and follow her on Twitter, YouTube, and Instagram. Snow and her new partner, Veiko, together with the legion scout Dekklis, uncover a conspiracy that will destroy the Republic from within. It seems that the goddess is back from wherever dead gods go. She has not forgotten the Republic, and she wants revenge. Loyal Dekklis will do anything to save the Republic, and Snow reluctantly agrees to help—until she realizes that “anything” means sacrificing Veiko. Now Snow must decide whether her partner’s life is worth betraying her allies and damning the Republic to war. This is the first in the On the Bones of God series - a series set in a "Scandinavian version of ancient Rome" - how freaking cool does that sound!? Smoke collected on the belly of the storm. It rose up in slim fingers above the tree line, coiled into a fist when it cleared the ridge. Hung there and spread against the underbelly of the clouds like oil across water. If a man stood just so, facing into the wind, he might imagine that it was the forest burning. Except this was the wrong season for natural fires. Too cold, too wet, snow underfoot and more waiting overhead. It was the wrong smell, too, for burning trees. The wind brought a firepit stink, flesh and charcoal and dung. Village smells, which most days meant sure shelter, with a storm on the way. Then that man would peer skyward and consider the clouds, and give thanks to his ancestors that the village was so near and that he had a sackful of tradables to buy his welcome. Snowhare skins, soft and white. A fine rack of antlers he’d taken off a bull elk that had broken through the snow-crust upslope a day ago, weak and furious and an easy mark for arrows. Good fortune, Veiko had thought then. Meat and hide, horn and hooves. Worth the extra day spent above the trees while the storm gathered. Worth the weight on the hike down. A stranger did not walk into an Alvir village unchallenged, from the forest, looking like Veiko did. A stranger came by the road, with goods and hands on clear display, his axe on his hip and bow slung on his back. Except on that road now, there was a column of soldiers jogging toward the crease in the hills, and the smoke, and the village. Their collective breath streamed out behind them like steam off a boiling pot. The standard-bearer’s flag clung sullenly to its pole, wrapped tight against the gusts. Illhari legion, armed and armored and moving fast. Now Veiko wondered if he’d caught the elk’s unluck. Failed to appease its spirit. Because that was not village smoke collecting there above the trees. Nor was that the smell of village cookfires. Charred meat. Charred wood. The smell of raiding. Had Veiko not found that elk, he might have been in the village when the raiders came, and it might be his meat stinking on the wind. He shivered. Perhaps it was not unluck the elk had given him. Perhaps its spirit had repaid him in kind: saved him from a trap and slow death in return for relief from the same. Beside him, Helgi heaved a deep-chested whine. Protest. Query. Distress, maybe, at the smoke-reek and the movement on the road. Veiko dropped a quick hand to the dog’s head. Glanced sidelong and found Logi halfway out of his crouch, ears up and curious. Logi knew roads meant villages, people, new things, and warm sleeping. But not that village, not now. Even if he might find walls still standing, or some shelter, the legion wouldn’t welcome him. Tall, pale foreigner, with village houses burned and people dead, no, they would—what was the Dvergiri word for it?—detain him. And likely shoot his dogs. Maybe throw him in chains after and sell him in the city. He’d heard his elders’ tales about Illhari justice. Best he get as far from the road as he could, as soon as he could. There were other villages. Let the raiders come for him, if they felt brave. Let them try to find him at all. Logi sighed and dropped his chin onto his paws. Helgi chuffed and settled back to his belly. And the three of them waited, part of the snowscape, until the last trooper bobbed out of sight. kept heads together. Two male, one female. And because Briel remembered her training: an eyeblink’s focus on the weapons. Plain legion blades, still sheathed. Short javelins in a sling on the larger man’s back. Crossbow on the woman’s. The night-and-blood diamond pattern on the tunics. They were from Cardik’s garrison, that was no surprise. But to arrive at this toadshit village already, this fast—Laughing God, that was. The sending ended, and the blindness came. Price of a svartjagr’s sending, yeah, count it out in heartbeats. No need for panic. Listen to the sizzle where her jenja had landed, smell the sweet and spice. She thought about trying to find it, pat-pat in the snow. Salvage something of it. Swore instead and crouched, her hands flat to the wall of the ruined temple. Cold stone, slick moss, a dead Alvir god’s face roughing her palms. She waited for the sunrise stages of vision, black to grey to, well, more grey, in the shadowless pre-blizzard twilight. This wasn’t so different than the cave-dark of Below, without witchfire. Overhead, a whisper of wings and tail. A thump as Briel found a perch in what remained of the temple’s rafters. Soot sifted down from the impact, fresh stinging insult to offended eyes. Briel hissed. One of her three primary utterances. Big talker, Briel. Snow squinted up, scanned the rafters. Stone building, this one, the corpse of a temple gutted during the Purge. The walls still stood, moss- grown on the north sides, the tough mountain spine-vines on the rest. Most of the roof had spilled down between them. The thatch had gone first, collapsed and left a rib cage of crossbeams. Briel’s hide matched the wood’s greasy black. Invisible until she dipped her long neck and stared down at Snow. In the twilight, the svartjagr’s eyes glowed like embers. Like the village had when the last of the fires sputtered to ash. She and Drasan had picked through the wreckage, expecting the odd bit of surviving silver and coin. Instead, they’d found all the wealth you’d expect in an Alvir village on a caravan route, wealth no raiders would have left behind. 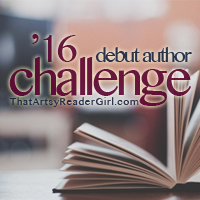 I think this sounds too cool and am so glad I've got the chance to share it with you today! And now for the giveaway - to enter, simply fill out the Rafflecopter below before Monday, August 15. Open US only and no PO boxes. Hi, everyone! Today I'm super excited to be part of the TLC blog tour for Susan Spann's latest Shinobi mystery, The Ninja's Daughter. As part of the tour, I am giving away a copy of the very first Shinobi mystery, Claws of the Cat, so be sure to read through to the end to enter. Hiro and Father Mateo have made a name for themselves as clever and reliable investigators - more so than the local authorities for sure! So when a local merchant's nephew awakens next to a dead body, certain he'll be held responsible but claiming no memory of the crime, it's Hiro and Father Mateo he runs to for help. As it turns out, the police have no interest in pursuing a case; the victim is a local actor's daughter and her class precludes any investigation or charges. In spite of - or rather because of - this loophole, Father Mateo is more determined than ever to unmask the killer. And Hiro himself is obligated once it's discovered exactly who the victim's father is. Unfortunately for the two, the political climate of Kyoto has become increasingly strained. The yoriki is adamantly against their involvement in the investigation and the protection the two had previously enjoyed as friends of the emperor seems to hold less weight than before. Susan Spann's Shinobi series is super fun and quite unique - to the best of my knowledge, hers is the only series focused on this particular time period in Japanese history. And it's a time that, as Susan points out in interviews, lends itself well to a mystery/suspense series because the political tension was so high. 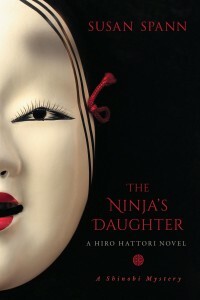 Those politics make it especially difficult for Hiro and Father Mateo to investigate in The Ninja's Daughter. And while it would be easy to simply forgo any involvement in the death of an actor's daughter, especially when the boy who approaches them isn't going to be charged, Father Mateo is driven by a motivation Hiro actually isn't quite clear on. Hiro, however, is driven by obligation. In addition to the politics and hierarchy of sixteenth century Japanese society, each installment of the series does involve a different aspect of Japanese culture. In book four, it's the theater community and Nō that get center stage, so to speak. Admittedly this is a period of history that I know nothing about, so Spann's painstaking research and attention to detail definitely make this series a real stand out. I love getting a glimpse into a society and history that are completely outside my own knowledge base. It's refreshing and fascinating! 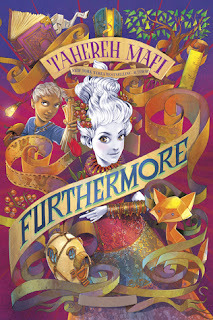 And yes, while this is the fourth book in the series and there are some aspects of Hiro's and Father Mateo's relationship that you'll miss out on by not having read the prior installments, like its predecessor's The Ninja's Daughter does stand alone rather well. It also avoids spoilers from the previous books, making it easy to start here and go back to the beginning. Speaking of the beginning, today I am offering up a chance to win the very first Shinobi mystery, Claws of the Cat. To enter, simply fill out the Rafflecopter below before Monday, August 15. US only. To see more stops be sure to check out the official TLC tour page here. For more on Susan Spann and her work you can visit her website here. You can also friend her on Facebook and follow her on Twitter. Happy book birthday - and real birthday - to Emma Newman! 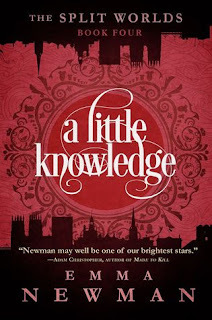 Readers, I'd promised you a review of Emma Newman's A Little Knowledge today, but alas I haven't yet finished it. Instead, this'll be a highlight post with the promised giveaway, because I want you all to be intrigued by and looking to purchase the series today! Plus, this way I'm able to avoid spoilers for those of you who haven't yet started the series. Cathy and Will are now the Duchess and Duke, rulers of Londinium, the biggest city in the Fae-touched Nether, but they have different ideas of what their authority offers. 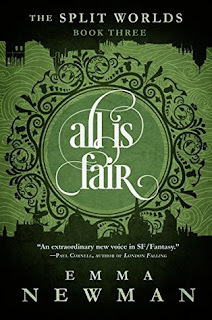 While Will is bullied by his family and his patron, Lord Iris, to maintain total control and have a child with his wife, Cathy wants to muscle the Court through 200 years of social change and free them from their old-fashioned, Victorian moral strictures. Despite their differences and the machinations of their enemies, the power couple maintain their marital harmony— until one of them takes a step that is simply too far. I absolutely adore this series! In fact, I'm sorry I missed discovering it when the first three originally released. But it has meant literally being able to binge the series, diving into one installment after another, for the ultimate reader satisfaction. I do hope that I've succeeded in making you curious by the series. As I said, I've been loving each and every book and want everyone to read them! And I'm stoked to have discovered today that there's to be a fifth book in the series, releasing next year. Squee! And now for the giveaway! Thanks to the publisher, I'm able to offer up one copy of Between Two Thorns, the first book in the Split Worlds series. To enter simply fill out the Rafflecopter below before Monday, August 15. Open US only and no PO boxes please. All is not running smoothly in Londinium. Many are not pleased with Will Iris's taking of the throne, including Cathy. But, having resolved herself to staying in the Nether, she's decided to make the best of it. Meanwhile, Max feels he's getting closer to the truth about the elimination of his order but has lost the support of the Sorcerer. Going it alone means once again reaching out for Cathy's help, but they'll have to tread carefully now that Will has begun paying more careful attention to her actions. Ooh, things are heating up again in the Split worlds! One of the things I really love about this series is the way each installment is peppered with plot threads and information that play into and eventually pays off in later books. It makes it easy to move from story to story without losing momentum or interest. Of course the fact that we're following the same core group of characters through a timeline that's fairly compact also keeps the moment and interest high. Sam is back again with a story that is definitely starting to make more sense as we progress. Additionally, we're finally given insight into another of the Sorcerers and his world as well as Margritte, who we met briefly in book two. Oh, and Ms. Rainer's story is beginning to finally come into play more too. So see, lots of gloriously fabulous threads, which lead to answers to some questions, and more new questions to consider! Happy Monday, readers! 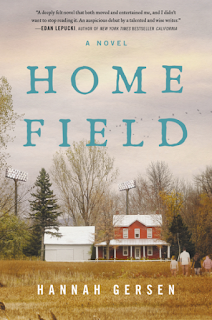 Today I'm a stop on the TLC book tour for Hannah Gersen's Home Field. Dean is a football coach. It's a sport he loves, one he knows better than anything. Certainly better than parenting. But after his wife commits suicide, Dean finds himself alone caring for their three children. Finding the balance between work and family, all the while dealing with grief, is a lot for anyone to handle. For Dean it will mean rediscovering what's most important in his life. 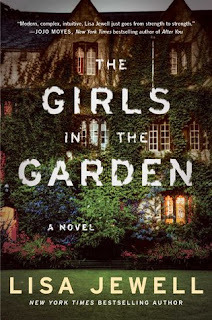 When this one came across my radar, first as a tour title and then as part of the Harper Collins live event on Facebook where the various marketing and publicity folks talked about their favorite reads of the summer (and I can't find the darn link). Of course the one thing that stood out for me was the comparison to Friday Night Lights - the show. It's a comparison that could go oh, so many ways, but one that led me to hope that Gersen's debut would be more focused on the characters and their stories than just football. And it was. Very much so. Dean and his family are still grieving the loss of Nicole. Each of the kids is dealing with it - and normal kid stuff - in their own varying ways. And of course Dean isn't there as much as they'd like him to be. We know, too, that it's been this way for some time. Home Field certainly covers territory we've seen before, meaning there aren't any big surprises. It's the characters themselves that will draw you in as a reader. Gersen has done a great job fleshing them out, creating tension between them, and giving them voice, making it easy to see them as fully rounded real people rather than constructs on the page. They earn your sympathy and your affection, making you care about their story. To see more stops on the tour be sure to check out the official TLC tour page here. For more on Hanah Gersen you can visit her website here.